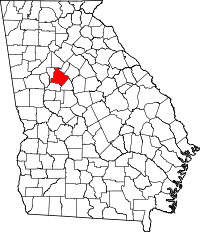 Henry County is a county located in the north central portion of the U.S. state of Georgia. Per the 2010 census, the population of Henry County is 203,922. The county seat is McDonough. The county was named for Patrick Henry. Henry County is part of the Atlanta-Sandy Springs-Roswell, GA metropolitan statistical area. It is home to the Atlanta Motor Speedway in Hampton. The Henry County Courthouse is listed on the National Register of Historic Places. In 1995, Henry County was the sixth-fastest-growing county in the United States. Henry County, Georgia was created by the Georgia State Legislature in 1821 from land acquired from the Creek Indian Nation by the First Treaty of Indian Springs. Henry's original land area was much larger than it is today, stretching from near Indian Springs (present-day Indian Springs State Park) in the south to the Chattahoochee River near Sandy Springs in the north; encompassing most of present-day Metropolitan Atlanta. Before one year passed the size of the County was diminished through the separation of land areas which, in whole or in part, became present day DeKalb, Fulton, Fayette and Newton Counties. Later divisions resulted in Clayton, Spalding, Rockdale and Butts counties. In the beginning Henry County was a virgin wilderness, having just been ceded from the Creek Nation. Prior to 1821, the Creeks and a few trappers and traders were the only residents of this area. The Creek Indians left their mark through place names, a few small Indian Mounds scattered around the County and through the arrowheads and broken pottery which can be found throughout Henry County. Jesse Johnson, son of John Johnson and great-grandfather of U.S. President Lyndon Baines Johnson, was a "first settler" of Henry County. He was a prosperous farmer, the second sheriff (1822–1835), and judge, before he moved to Texas. According to the U.S. Census Bureau, the county has a total area of 327 square miles (850 km2), of which 322 square miles (830 km2) is land and 4.4 square miles (11 km2) (1.4%) is water. The vast majority of Henry County is located in the Upper Ocmulgee River sub-basin of the Altamaha River basin, with just a very small western corner, west of Hampton, located in the Upper Flint River sub-basin of the ACF River Basin (Apalachicola-Chattahoochee-Flint River Basin). Henry County operates its own reservation-based transit service for use by county residents. In addition, Xpress, a regional commuter bus service operated by the Georgia Regional Transportation Authority, serves park-and-ride lots in Stockbridge, Hampton, and McDonough. As of the census of 2000, there were 119,341 people, 41,373 households, and 33,305 families residing in the county. The population density was 370 people per square mile (143/km2). There were 43,166 housing units at an average density of 134 per square mile (52/km2). The racial makeup of the county was 81.38% White, 14.68% Black or African American, 0.23% Native American, 1.76% Asian, 0.04% Pacific Islander, 0.79% from other races, and 1.13% from two or more races. 2.26% of the population were Hispanic or Latino of any race. Census Estimates from the 2008 American Community Survey indicate that the African-American population is 32.6%. In the county, the population was spread out with 29.20% under the age of 18, 7.40% from 18 to 24, 34.90% from 25 to 44, 21.00% from 45 to 64, and 7.40% who were 65 years of age or older. The median age was 33 years. For every 100 females, there were 97.30 males. For every 100 females age 18 and over, there were 93.80 males. As of the 2010 United States Census, there were 203,922 people, 70,255 households, and 54,445 families residing in the county. The population density was 633.0 inhabitants per square mile (244.4/km2). There were 76,533 housing units at an average density of 237.6 per square mile (91.7/km2). The racial makeup of the county was 55.0% white, 36.9% black or African American, 2.9% Asian, 0.3% American Indian, 0.1% Pacific islander, 2.4% from other races, and 2.4% from two or more races. Those of Hispanic or Latino origin made up 5.8% of the population. In terms of ancestry, 10.7% were American, 9.3% were Irish, 9.2% were German, and 8.2% were English. Of the 70,255 households, 45.6% had children under the age of 18 living with them, 55.9% were married couples living together, 16.4% had a female householder with no husband present, 22.5% were non-families, and 18.5% of all households were made up of individuals. The average household size was 2.89 and the average family size was 3.29. The median age was 35.3 years. The median income for a household in the county was $63,923 and the median income for a family was $70,972. Males had a median income of $50,198 versus $39,785 for females. The per capita income for the county was $25,773. About 6.3% of families and 8.3% of the population were below the poverty line, including 11.7% of those under age 18 and 5.8% of those age 65 or over. Goya Foods has its Atlanta offices in an unincorporated area near McDonough. Additionally a pair of warehouses used to exist along US 23 south of McDonough. One of which was owned by Whirlpool Corporation, and the other by Toys 'R' Us. WKKP is the local radio media outlet. It broadcasts 24 hours a day on 100.9 FM and 1410 AM, and has a classic country format. The Henry Herald and the Henry County Times are the local county news print media. The semi-professional soccer team Georgia Revolution FC plays in the National Premier Soccer League at the Warhawk Stadium. Local public schools are operated by the Henry County Schools. Mercer University has a Regional Academic Center in McDonough. The center, opened in 2003, offers programs through the university's College of Continuing and Professional Studies and Mercer's Tift College of Education. Clayton State University and Gordon College also offer a range of college courses at the Academy for Advanced Studies in McDonough. Southern Crescent Technical College's Henry County Center (in McDonough) offers programs in Allied Health, Business Technology, Logistics and Supply Chain Management, Computer Information Systems, Personal Services, Public Safety, and Drafting Technology. ^ "Henry County QuickFacts from the US Census Bureau". quickfacts.census.gov. Retrieved 2018-03-24. ^ "Fastest-growing counties, 1990-95". usatoday30.usatoday.com. Retrieved 2016-02-23. ^ Caro, Robert A. (1983). The Path to Power. The Years of Lyndon Johnson. New York: Alfred A. Knopf. p. 15. ISBN 0394499735. LCCN 90201781. ^ "Henry County Board of Commissioners | Board of Commissioners". www.co.henry.ga.us. Retrieved 2018-03-20. ^ "Loading site please wait..." www.cityofstockbridge.com. ^ "Henry County Board of Commissioners > Departments > S - Z > Transit Department". www.co.henry.ga.us. Retrieved 2018-03-20. ^ "2017 County Migration Rates, Population Estimates". Retrieved March 22, 2018. ^ "State & County QuickFacts". United States Census Bureau. Archived from the original on July 11, 2011. Retrieved June 23, 2014. ^ "Contact Us." Goya Foods. Retrieved on March 26, 2016. "Goya Foods of Atlanta 4005 Haworth Parkway McDonough, GA 30253"
^ Record of Appointment of Postmasters, 1832-1971. NARA Microfilm Publication, M841, 145 rolls. Records of the Post Office Department, Record Group Number 28. Washington, D.C.: National Archives. Taste of Henry An annual fundraiser that showcases many of Henry County's best restaurants. Kelleytown, GA Website run by Mr. Beau Kelley, a descendant of the original family to which the community is named. A Friend's House Henry County's emergency shelter for abused, neglected, and abandoned children. Howard, John. "The Sub Series: Henry County, Georgia." Southern Spaces, January 26, 2010.